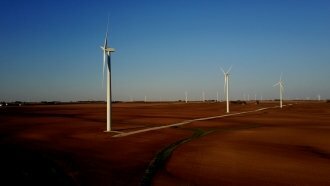 Wind energy is booming in Middle America and creating a huge demand for workers who can keep turbines spinning. Wind turbine technician is the fastest-growing job in America. "You always take pride in what you want to do, right?" asked Derek Gruis, a wind turbine technician. "That's kind of the mentality of a blue-collar job. You come to work. You do the right thing. I definitely think it's a huge future here." Across the U.S., more electricity is coming from wind turbines. And that means more wind turbine technicians are getting hired. For the past few years, no other job has grown faster. And a lot of that job growth is in rural areas. The median salary for a wind technician is about $52,000 annually. Now, schools are training the next generation of wind turbine technicians to satisfy the growing demand for more workers. "We need another quarter million people out there working in this industry, so that's a pretty tall order," said Daniel Lutat, who trains future wind turbine technicians at Iowa Lakes Community College. "So right now, [the Department of Labor] puts us growing at about 108 percent for the next decade. I think that number's a bit higher if you do the math." But to do this job, you need some serious technical knowledge and must be really comfortable with heights. "The view just makes it," Gruis said. "But just the satisfaction of just working and building a new portfolio of energy for the U.S. every day. When you come to realize it, it's pretty cool."